The white stands for peace and unity, while the blue represents the water and the sky- and is also alluding to the flag of Timur, who ruled over the area in the 14th Century. Green officially stands for 'nature and fertility' but might also represent Islam and the thin red stripes are for the 'life force' within everyone. The crescent at the canton stands for 'the rebirth of Uzbekistan as an independent country' and for the Islamic faith of 88% of the country's population. The twelve stars are for the months of the Islamic calendar as well as (and this is sort of a weird combo, to me) the twelve signs of the zodiac. 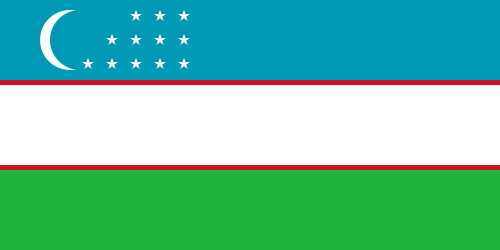 So, that's the flag of Uzbekistan! Remember, until next time, keep your flags flying- FREAK or otherwise.